Yesterday we traveled in Victorian style, and this has nothing to do with Dr Frankenstein's Travelling Freak Show. Yesterday Georgina, Antonio and I went to Newport's Transporter Bridge to meet Mike Lewis, the Museums & Heritage Officer for Newport to talk about making a celebratory performance that would take place on the moving bridge toward the end of the year. Not only was meeting Mike and hearing about the history of the bridge an absolute pleasure, but we got to stand; braced and ready on the wooden platform awaiting the call of "All Aboard!" before the platform jutted and moved away leaving the safety of the roadside behind us as we drifted like ferrymen across the River Usk. Inspiring would be an understatement. We were in awe. Only ever having gone to visit the Transporter Bridge as a stander-by I'd never actually travelled on it before, and the experience was not quite what I was expecting. The atmosphere and sense of history the moving platform evoked as Mike explained the bridge was built for the steelworkers of Pill, who would pile on for trips across on early mornings, was awesome, and as our hands gripped the bright blue bannister and we saw the other side of the Usk bank slowly approach I think all our minds were full of ideas and questions. 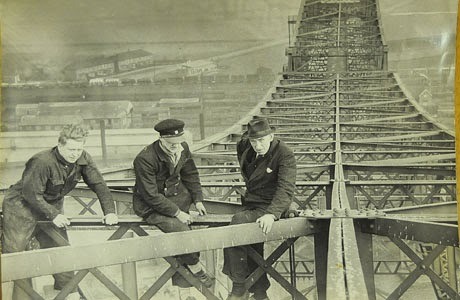 I'd always had a thought about performing something on the bridge, and it seems the opportunity to create a piece of work that responds to the bridge and uses it's cultural heritage and history infused with people's stories as stimulus could become a reality. To celebrate something that should be celebrated more. To try an re-connect the people of Newport to one of it's most under-polished jewels. Riding the bridge is an amazing experience, if you haven't done it I'd highly recommend it. Steeped in history, fuelled with adventure, the Newport Transporter Bridge is an engineering marvel that's beautiful, blue and on the ruddy doorstep. 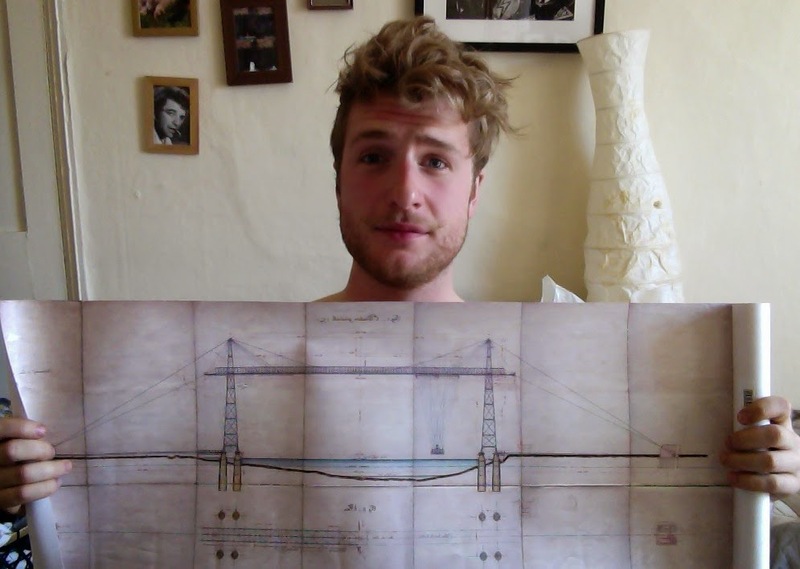 A tired me holding my Transporter Bridge Blue-Prints bought from Newport Library. 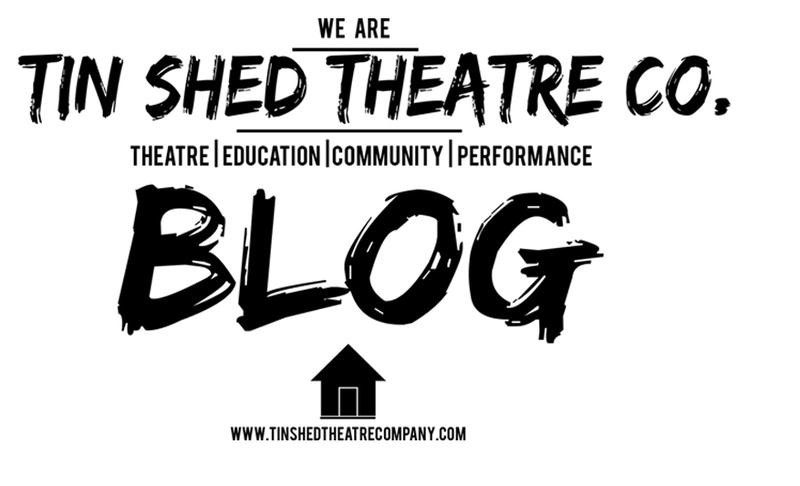 We are desperate to meet our WeFund.com goal of raiding £1,000 in donations towards taking our Newport made, home grown work to the San Diego Fringe Festival later this year. We have almost all the funds we need, but if you're feeling generous please donate and help us get there; To share contemporary Welsh Theatre with an international audience, to strengthen links between continents with the mind set to forming inter nation relationships that can cross pollinate artistic cultures here in Wales and in California. If you'd like to donate please do: CLICK HERE to see donation page.